Why not party with the writer? Home › LOCAL › Why not party with the writer? JANE ENJOYS eating car-amel apples and writing her weekly column in the Independent-Scout. 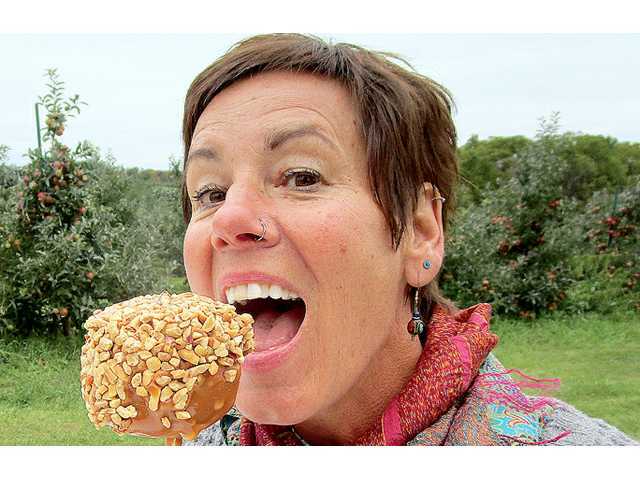 Why not join her at Fleming’s Orchard on Saturday, Oct. 13 to celebrate both? POSTED October 10, 2018 3:05 p.m.
GAYS MILLS - The public is invited on Saturday, October 13, from 1 to 3 p.m. to join author Jane Schmidt in celebrating five years of writing her column, ‘Jane’s World,’ for the Crawford County Independent and Kickapoo Scout. The party will take place at Fleming Orchards at 46054 Hwy 171 in Gays Mills. Hear stories about Jane’s time working for Flemings, peeling mountains of apples, baking pies, and her favorite task, dipping apples into a huge vat of caramel. More than once, Jane has mentioned that she wished she could have stuck her fingers in there—if only Ruth Fleming hadn't always been watching! Jane will also bring copies of her book, ‘Not A Perfect Fit,’ published by She Writes Press. ‘Not A Perfect Fit’ collects more than 95 of Jane’s columns and makes a great holiday gift for anyone wanting to share stories of a wacky rural life with Jane’s menagerie of animals, serial dating escapades, entertaining mishaps, and malapropisms. As a thank-you to readers, Jane will be offering a five-dollar discount on any of her books with a purchase from Fleming's during this event. Have your cake, eat it too, and say hello to Jane! What happens if Babcock Genetics WPDES permit is denied by DNR?